When I was about 12 (give or take a couple of years), I had what I thought was a fantastic idea. I was going to build myself a volcano. I’m not talking about a little model made out of clay with vinegar and baking soda for the special effects. I wanted to construct a dirt cone in the backyard that was hollow inside and large enough to use as a clubhouse. I was a bit sketchy on the actual structural details, but I figured I’d start by digging a nice big pit, then add some sort of frame and cover it over with the dirt I’d removed previously. So I got an old piece of garden hose and formed it into a circle about 15 feet (5m) in diameter on the lawn to mark the perimeter of the volcano. The actual digging turned out to be a lot harder than I’d imagined—so hard, in fact, that after shoveling about two scoops of dirt I decided I’d better take a break. Weeks later, when I still hadn’t resumed my project, my mother told me to get that hose out of the middle of the yard, and while I was at it, mow the lawn. Reluctantly, I put the hose away, only to find it had left an unsightly yellow ring on the grass. It looked as though a flying saucer had landed, and the ring didn’t fade until the following spring. I was embarrassed at both my inability to build my volcano and the condition of our lawn. It never occurred to me that with a bit more effort, I could have turned my blunder into a huge piece of art—say, a smiley face or a basketball. Just as well; I think my parents would have frowned on that. But nowadays, grass art—based on the very same principle I unwittingly discovered—has reached an exceptional level of sophistication, as artists create giant, stunningly detailed photographs on living grass. When grass gets plenty of sunlight, it produces chlorophyll and therefore turns green—but the less light it receives, the more yellow the color is. British artists Heather Ackroyd and Dan Harvey discovered that by projecting a bright black-and-white negative image onto a patch of grass as it grows (in an otherwise dark room), they can use the natural photosensitive properties of the grass to reproduce photographs. When I saw one of these grass photos on display at a museum, I was utterly captivated. From a distance it looks like any other monochrome photograph (albeit with a slightly unusual tint); up close, it looks like perfectly ordinary grass. But even individual blades sometimes have a range of hues, as any given cell can respond to the amount of light it receives. Ackroyd and Harvey stumbled onto this technique after producing an installation that involved covering an indoor wall with living grass. A ladder was leaning against the wall, and the artists noticed that even after it was removed, a faint outline of the ladder remained on the grass. They set about experimenting with ways of enhancing this effect, and soon they were using a slide projector as an artificial light source for growing their unique photographs. A typical exposure time is just over a week, with the image projected for 12 hours a day. At first, the grass photos faded within several days, as the grass adapted to the light conditions in the place where it was exhibited. 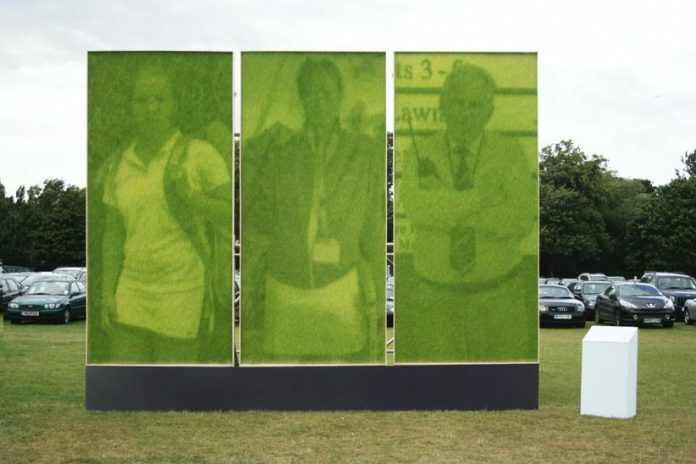 Ackroyd and Harvey began looking for ways of increasing the longevity of their images, and they found a genetically modified strain of grass called stay-green. Engineered by researchers at the Institute of Grassland and Environmental Research (IGER) in Wales, stay-green grass cannot break down chlorophyll easily and thus retains most of its green color—even after it’s dead. When using stay-green grass as their medium, Ackroyd and Harvey dry out their grass images rapidly as soon as they’ve matured. Although this kills the grass, the images remain visible for years, rather than days. The IGER scientists working on stay-green grass were impressed with the artwork to which their product had contributed. And while looking at some digital images of the grass artwork, they came up with yet another innovation—a noninvasive way to study the chemical changes in the pigments of leaf cells as they age. Their technique, called hyperspectral imaging, relies on a computer to analyze colors that are too similar to be distinguished by the human eye. So science contributed to art, which in turn contributed to science—and sure enough, this additional research has inspired the artists to explore new creative directions. Ackroyd and Harvey have done grass art installations all over the world. They are especially proud of the fact that although their medium is by nature temporary, the images can be regrown at any time. Some of their most famous pieces have been recreated several times already. If I ever have enough money to commission a work of art, I’m going to ask them to grow me a photograph of a volcano. Note: This is an updated version of an article that originally appeared on Interesting Thing of the Day on July 21, 2004.